Due to an unexpected change for our plans for a scouting/survey mission to Honduras, Catherine and I have suddenly found ourselves in a position to attend the Entomological Society of Canada/Entomological Society of Ontario Joint Annual Meeting in Guelph! I am not sure that our abstracts will be fit in for talks, but I sure hope so. If not I will probably bring a really cool poster. In celebration, I walked outside the lab, and what should I find but a handsome Western Conifer Seed Bug, Leptoglossus occidentalis, a species that our lab has studied in the past. Seems like these bugs have infrared sensors built into their abdomens that allow them to find the relatively hot maturing conifer cones on which they feed. This time of year, adults are seeking warmer sheltered locations in which to overwinter, and since they can’t go to Honduras, they often come indoors. I found this one perched on a still-warm hood of a delivery van outside. 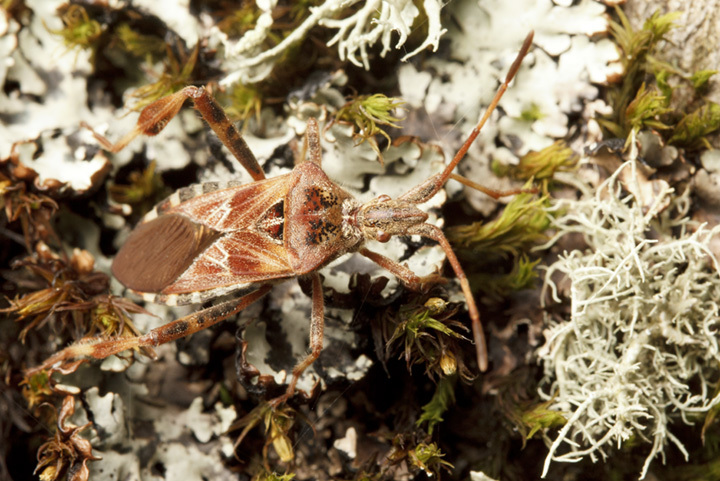 Consider this blog post fair warning then, my eastern comrades, that like the Western Conifer Seed Bug, we are coming to Ontario in numbers, ready to rock your socks with some BC-style sciencing! ← Stand Up For Science! I just saw one on my balcony and I saw one at the superstore this time last year. Is there any reason they show up here this time of year? Well, they do seek out hibernacula, often in structures. In the time leading up to winter they often bask in aggregations outside hiberrnacula, and again also in the spring. They are similar to Boxelder bugs in that respect.